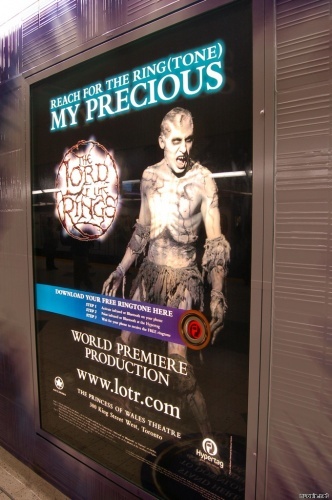 OK, I guess this is cool. Here's a site that promotes the Nokia N91 phone that can hold 3,000 songs. Of course, that probably mean 3,000 two minute songs versus 3,000 songs of actual normal length but that's not the point. The site features a guy in a suit that makes music when he moves. You can program the guy to do things, create a song and save your performance. Oh yea. There's screensavers (who the hell needs those anymore? ), wall papers and mobile goodies. 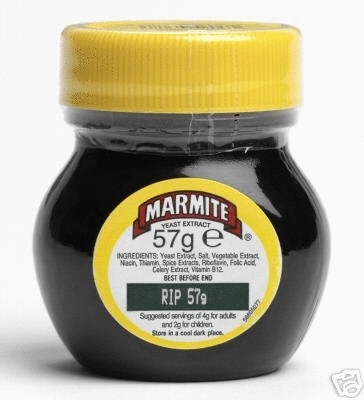 Marmite, that weird spreadable, edible stuff those in the U.K. seem to love, is auctioning off its last 57 gram jar of the stuff on eBay along with the first sqeezable plastic tube of the stuff. Apparently, a glass jar of the stuff is considered a collector's item. Currently, there are 38 bids with the highest at 170 Pounds. If you can actually get the video to work (keep your mouse moving. We have no idea why but it helps), a collection of U.S. creative directors get their goof on to call attention to ihaveanidea's Portfolio Night IV, a multi-city portfolio review event where those interested in breaking into the business can get their work in front of America's top creatives...or at least in front of the people occupying the top spots in America's ad agencies. To accompany the new "America Runs on Dunkin'" re-branding campaign Dunkin' Donuts has launched the D Stop, a customer loyalty/entertainment type micro-site. Created by Captains of Industry in Watertown, MA, the D Stop features a various content, including a live action film, an animated short, video e-cards, a "Dunkin' Diagnosis" quiz, and a downloadable order form to somehow make getting your morning fix easier. The D Stop also gives Dunkin' customers a place to go to find out more about the Rechargeable Dunkin' Donuts Card, as well as a chance to win a $100 Dunkin' Donuts Card everyday until 5/11/06. OK, then. Somebody, Jeremy Abbett according to Whois, went out and created a site that pits the large holding companies (Old Ones) against the independents (Young Guns). Lining up fpr the Old Ones are WPP, Dentsu, Omnicom, Publicis and Interpublic. Stepping on the field for the Young Ones are W+K, CP+B, Naked, Mother and Strawberry Frog. It's a game of strength as the Young Guns hurl media bombs (TV, Print, Net and WOM) at the business-suited Old Guns hoping to eradicate their asses from the world. While it's funny, it's also a pretty clear representation of what's going on in the ad agency world right now. As it turns out, Jeremy Abbett is a partner at Truth Dare Double Dare, a design studio that probably hopes to eradicate the world of both Young Guns and Old Guns so it can take over all creation of the earth's marketing.